"A Commonwealth medal would be the icing on the cake," reflects 35-year-old Chris Brown as he looks back on a successful career as a 400m runner. For the Bahamian athlete, Glasgow may represent a last chance to win the individual 400m title following his success in the 4x400m relay at the Manchester Games in 2002. After picking up medals at the Olympics and World Championships, Brown is now focussed on completing his medal collection in Glasgow. "I am definitely looking forward to closing my books and have a complete set of medals - World indoors, World outdoors, Olympics," he said. "It would definitely mean a lot to me, knowing that I have a Commonwealth medal to go with the rest." Brown is no stranger to Glasgow, having competed in the city at the Glasgow International Match in recent years. 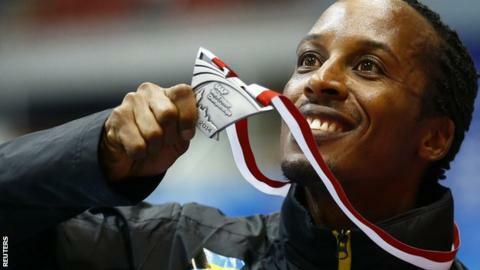 At this year's event in January, he won the 400m ahead of British star Nigel Levine with a time of 45.93 seconds. Along with his countrymen, he also finished second to a Great Britain and Northern Ireland team in the 4x400m. "The Glasgow crowd are very energetic and enthusiastic about athletics," said Brown. "They have a great knowledge of the sport. They know the stats. They know who we are. "It is a great feeling knowing the fans are not just taking up a seat - they are there to witness somebody that you know, somebody that you have been following." As well as the 400m and the 4x400m, Brown said he may also race in the 200m at the Commonwealth Games. In his preferred 400m, he will be one of the favourites along with Kirani James, from Grenada, and Javon Francis, from Jamaica. However, James and Francis are of no concern to Brown. "Right now, I see myself and the clock," he added. "I really don't see anyone as my main competitor. "When I compete, I compete against the clock and compete against myself. I don't worry about the rest of the guys in the field. On any given day, anything can happen." When Brown started out in athletics on the island of Eleuthera, he wanted to follow in the footsteps of his family and friends and become a sprinter. He talks fondly of his childhood when he would happily run to the shops on errands for his parents so he could try to beat his previous times. Eventually, Brown developed into a 400m runner and was given a scholarship at Southern University in New Orleans when he was 18. A year later, he transferred to Norfolk State University in Virginia to complete a degree in physical education. He has stayed in the United States ever since and is now based in Atlanta, where he trains with coach Innocent Egbunike. For Brown, he has already achieved three Olympic medals, four at the World Championships and five at the World Indoor Championships. His personal highlights are the 400m gold at the Pan American Games in 2007 - his first major individual gold - and the 400m World Indoors gold in Doha four years ago. British athletics fans, however, will probably remember his triumph at the 4x400m final at the Olympics in London in 2012. Victory for the Bahamas consigned the United States to Olympic defeat in the event for the first time since 1972. Reflecting on that win, Brown said: "It was all about strategy. We were all in great shape and going into the Games. We were very hungry for a medal. "Knowing the US guys were always winning, winning, winning, we wanted to stop that. That has been our mission. We attacked from the beginning of the race and made them play catch up." Brown's appearance in Glasgow will be his fourth Commonwealth Games after competing in Kuala Lumpur in 1998, Manchester 12 years ago and the 2006 Games in Melbourne. His preparations, and those of his fellow athletes from the Bahamas, were put into focus with the arrival of the Queen's Baton Relay on the islands. The baton, which will play a key role in the opening ceremony of Glasgow 2014, is the main event for the Bahamas in the lead up to the Games. Brown hopes to bring over his wife, Faith, and the couple's children, Emerald, aged four, and Zorah, aged two, to the event and is keen for the Glasgow trip to not just be about the competition. "I was told there was a castle," he muses, when asked what Glasgow attractions he would like to visit. "And the place where you guys make whisky. I would like to see the process of it." When informed that the castle he is thinking of is 50 or so miles along the M8 in Edinburgh, he laughed: "Maybe after I win my gold medal in the 400m and the 4x400m, I will be able to go out there - and go round the palace." Brown is definitely one to watch at the 400m race this summer. With that in mind, the good folks at Edinburgh Castle may want to have a wee dram ready for him. He could very well be paying them a visit quite soon.